Halal food in is a Greece question that is asked very often and I even have a youtube video that does pretty well with more in-depth information. I visit Greece very often and this year alone I have been around 5 times already with few more planned out. What I love is that I keep seeing more and more Muslims in places that 10 years ago there would only be Greeks. Every single day I will see at least one Muslim couple exploring the city or enjoying a walk on the promenade. Now as Muslim travellers and as a matter of fact any traveller Greece is on the top of the bucket list but for the Muslim Traveller halal food is not as easily available as it is for example in the UK. I know that Greece is working on this and there will be in the future no doubt a lot more options and choices for Halal food in Greece and even in hotels, currently you can find few restaurants mostly in big cities offering Halal food choices and there are no Halal hotels in Greece that serve food. If you find such hotels please do let me know because of my research I don’t know of any. 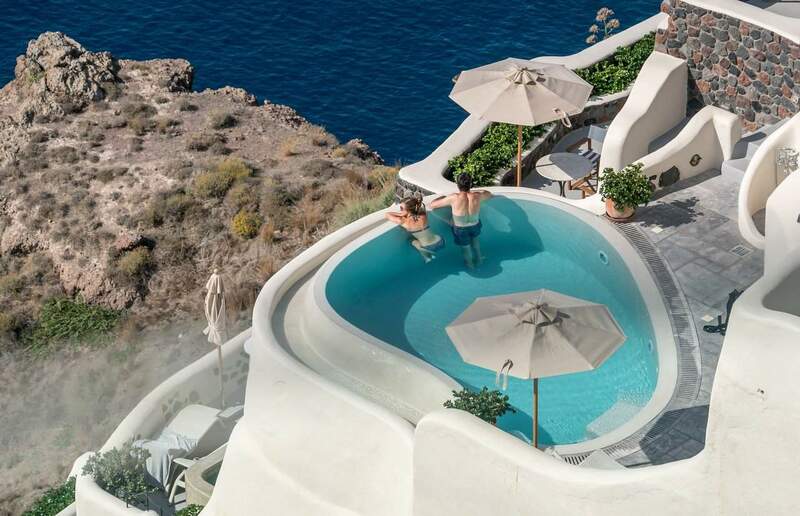 I am aware that there is a new property coming up in North Greece that will be the first of its kind Muslim-friendly choice in Greece for Muslim travellers but it will be set a little different than a halal hotel and rather as a Muslim-friendly Villa in Greece. Once this becomes open I will happily share the details with you. Muslims are different and many travellers have a different preference and understanding of their halal food needs. I know many people who are OK with eating chicken from Christian countries and other who won’t touch it. But Greece also has an amazing Mediterranean diet full of fresh fish and delicious vegetable dishes. Travelling for a week I really don’t mind eating vegetarian options or fresh fish, especially in the summer in the Greek tavernas near the sea. Even if your hotel doesn’t offer halal food I am sure they will have tavernas offering choices that you can enjoy and taste a little Greek food option. Here are some of my favourite “Halal” food options when I visit Greece and I can’t have the meat options as they are not halal. Fresh fish – Ask for the fish of the day which is usually grilled. I personally go for the fresh option even if it’s a little more expensive. Spanakorizo – spinach rice dish which I love with some yoghurt on the side. Veggie Gemista – my mum knows when I come home she always has veggie Gemista which is stuffed tomatoes and peppers you can have. Make sure they are without meat as there is also a meat option. Ladera – which is a type of cooked veggie dishes in a caserole, every taverna has this option and it’s great for those who can’t eat meat. Usually, they are a mixture of veggies cooked together with herbs. Vine leaves the Greek and ( better) version. Make sure you ask for the veggie option. Personally, I am not a fussy eater and I will eat sometimes the chicken ( there I said it) if I feel like it. But mostly I will stick with fresh fish since this is harder to find in the UK or Qatar. 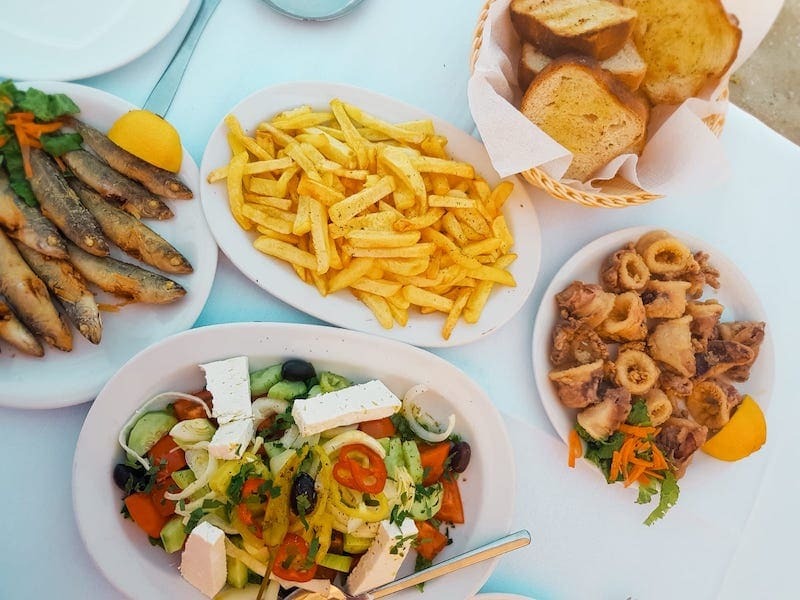 My go-to choice for enjoying dinner in a Taverna by the sea is good company, calamari, fries and Greek salad. This combination keeps me full and happy for a long time and I never miss the meat options. Don’t let the non-availability of Halal Hotels or Halal food in Greece let you stop visiting the country. On the contrary, If we want to have these halal food options in Greece in the future we should travel more often to the country and raise a point of asking for it. The only way businesses whether hotels or Tavernas will pay attention is if there is demand for these halal food choices. If there is trust me they will find a way and bring halal food on the table for you. Greeks know that you need customers to make the numbers work and it is our responsibility as travellers to let them know this is what we need. Insha’Allah ( God willing) it will then become a reality. Hi, first of all, thank you for your very informative blog. I have a question purely out of curiosity (not judging you here) is it ok to eat chicken from Christian countries? From my understanding the problem lays in the slaughtering method followed that makes it not halal to eat, is chicken differently slaughtered than lamb is ? Up to your knowledge & understanding? Again dear please be aware that I’m not judging at all. I’m asking to be informed. Pera in Athens has all halal beef. Confirmed by waitress shows knowledgeable about what halal means. Hurray!! !